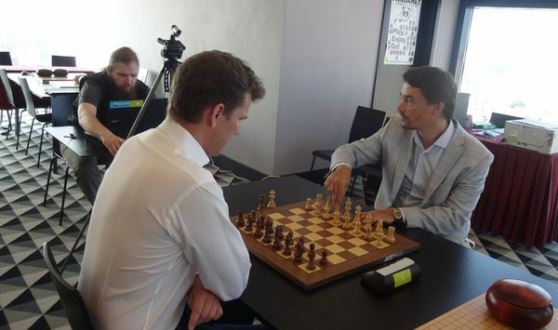 A special match between Alexander Morozevich (Russia) and Tiger Hillarp Persson (Sweden) took place during the European Go Congress, which gathered more than 1000 participants. The famous Grandmasters played two games of rapid chess and two games of go on the 18th floor of Azimut Hotel in St. Petersburg. Morozevich won 2-0 in rapid (25 min + 10 sec), while the score in Go was even 1-1. Thus Morozevich emerged overall winner. The chess games were commented by GMs Vladimir Fedoseev and Valery Popov. Morozevich and Hillarp Persson also played a simultaneous exhibition on 10 boards each.